Adult volunteer Sgt David Nicolson a member of the Staffordshire and West Midlands (North Sector) Army Cadet Force had his long overdue accumulated campaign service medal formally presented to him by the Lord Lieutenant of Staffordshire Ian Dudson CBE during a ceremony held to present the Queens Award for Voluntary Services to the County at Otterburn Training Camp in Northumberland. In June 1973 Pte David Nicolson enlisted into the Regular Army, he joined his local unit the 1st Battalion Kings Own Scottish Borderers and after training he joined his unit in Berlin where he stayed for almost 18 months. The unit was then posted to Palace Barracks, Hollywood on the outskirts of Belfast. Following a very successful tour the Battalion were then sent to Inverness Scotland where they stayed for four years, and during that time he was sent to Belize for a six month peacekeeping tour, back to Northern Ireland for four months then Kenya for six weeks. After leaving Inverness the Battalion went to Osnabruck and David served for a further four months in Northern Ireland before leaving the Army. After a break of three years, in 1989 he joined the T.A. as a Chef in the Army Catering Corps with 5th Battalion Royal Regiment of Fusiliers, where he stayed before they were disbanded in 1998, he then transferred to 202 Field Hospital where he remained until his retirement. Pte Nicolson by this time had reached the dizzy heights of a Class 1 Chef and the rank of Sergeant. Sgt David Nicolson joined the ACF on 31 October 2010 and lives in Coventry, West Midlands. He originally joined Warwickshire ACF before transferring to Staffordshire and West Midlands ACF in February 2013. He is currently appointed as a chef and parades weekends at the Centre for Adventure in Cannock Chase, where he provides quality meals for the adult volunteers and cadets. 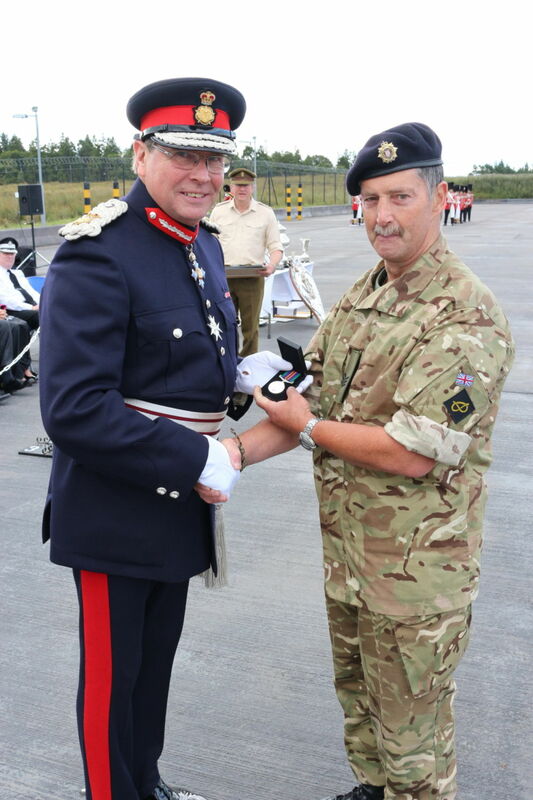 Due to his amalgamated time of 26 months active duty in Northern Ireland he is therefore awarded the accumulated campaign service medal.